Trying to narrow down the sound of eccentric French art pop project Saint Sadrill is the equivalent of forcing a square peg into a round hill using a sledgehammer – you might make it fit by using blunt force, but it would contort or destroy much of its original shape and appeal. Sometimes it’s better to just sit back and marvel at the sounds coming from your speakers/headphones. Don’t worry, though; I won’t leave you to twist in the wind, wondering what might await you beyond the play button on today’s premiere. 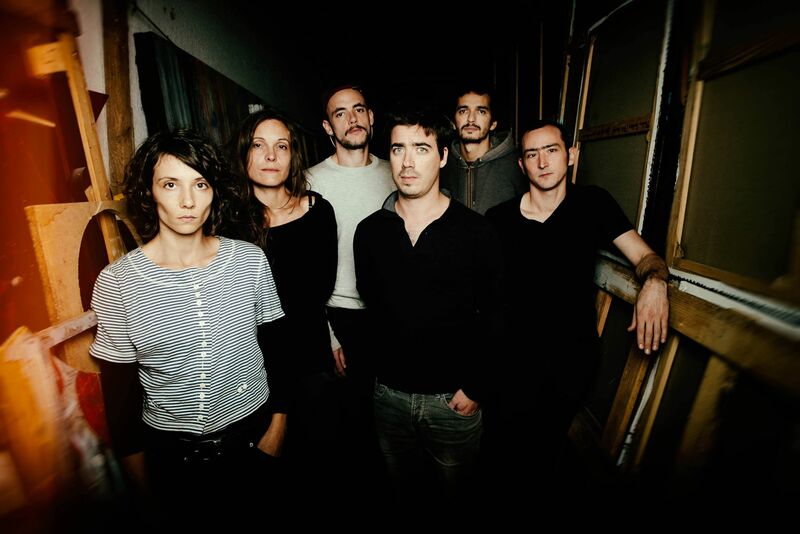 Lyonnaise musician Antoine Mermet, the main composer and vocalist behind the Saint Sadrill moniker, integrates elements of chamber pop, indie rock, prog, and electronica into his grand, genre-fluid vision of absolute artistic freedom. This freedom manifests itself in the form of Pierrefilant, the projects’s first proper full-length album (following the 2016 EP Building Lampshades), which just so happens to also be the first recorded output that was created by Saint Sadrill utilizing a full band set-up. Recorded over the span of only two days (!!! ), Pierrefilant was brought to life by Mermet and company wielding a vast array of rich instrumentation and a neverending thirst for musical boundary-pushing. The end result is roughly an hour and 18 minutes of intricate, brash, and dazzling soundscapes, performed by a tight band that’s coming fresh off two years’ worth of live performance experience. Nowhere is this experience more apparent than in the half-hour live session Saint Sadrill recorded at Studio Rouge back in February, which we have the immense pleasure of premiering for y’all fine people out there today! Smooth transitions: I got them! Anyway, you can check out the session below. Fun fact: Studio Rouge is located in Rivolet, a small commune of just under 600 inhabitants in Eastern France. Ergo, the whole atmosphere surrounding Saint Sadrill‘s live performance there is rather intimate. There’s only a small handful of people present aside from the actual band members – band leader Antoine Mermet on lead vocals, Melissa Acchiardi on vibraphone, percussions and backing vocals, Lionel Aubernon on drums, fx, and backing vocals, Lucas Hercberg on bass, Anne Quillier on keyboards and synths, and Vincent Redoux on guitar – to witness the show, which only goes to benefit the artful and confidently fragile songs. From the opening eleven-minute long track “Waiting For Him” to the final eruption of “Kiss Song”, everything about this session feels genuine, and the music is allowed to flow freely in a rather confined space. Of course, a recorded live session stands and falls with the quality of its sound and video. Luckily for us, the team involved in the organisation et enregistrement de ce concert did a wonderful job of giving us an organic, immersive view of what took place at Studio Rouge on February 4, 2018. The cuts and camera pannings are composed and sensible, making for an effective mis en scène for Saint Sadrill, while the sound is as crisp and detailed as these fantastic songs deserve. At times it literally feels as if the viewer were part of the select few lucky enough to attend this enchanting display of musicianship by one of the most exciting upstarts of 2018. Chapeau, mesdames et messieurs! If what you’ve heard and seen above struck your fancy even in the least, please make sure to head over to Saint Sadrill‘s Facebook page and show them some love! Pierrefilant is one of those underappreciated little underground gems that deserve much more attention than they actually receive, so don’t miss out on it. It’s been released on November 2 via Dur et Doux; you can stream/purchase it over at Bandcamp. The best hair in the game. Next PostGraf Orlock - "Examination of Violent Cinema, Volume 1"